lotusflasherman wrote: Oh... and John forgot the side repeater bulbs in his summation but don't worry as a flasher is off as much as it's on so doesn't heat the wiring like a continuous light. The FED car doesn't have repeaters, the side lights in our bumpers are part of the side/tail light circuit. However, Phil is right, at 5w each, they shouldn't cause any trouble. I have repaired or rewired a gazillion MGs and Triumphs over the years and the standardization of the color codes is very handy. I still looked at the M100 wiring diagram to make sure I had the colors right. Don't expect to find standard wiring on any Elise tail lights. I have 4 different car sets here and every part number is wired with different colors and none but the ground/earth (black) are to any convention. Rad fan control wiring (temp sensor to relays) should be black/orange and power feed to fans switched by relay should be black/green. SE, Fed & S2 diagrams shown as all the same in my manual. Any variation may be due to a previous owner or a bit of non-standard service work. I suspect a bit of ‘poetic licence’ by the factory with the colours. My manual shows green as the 12v supply to cooling fan relay pin 86 and black/orange from relay pin 85 to both temp switch and pressure switch (the latter isn’t connected as I don’t have aircon). And on the car (S2) it’s green supply but green/black to the switches. And I don’t think one of the three previous owners would have bothered rewiring from relay to switches - not least because the back of the relay is a b****r to get at behind the dash. Anyway, I’ve sorted out and documented what’s what, and I’m going to write an addendum for the wiring diagrams for whoever has the car after me (not that I’m selling ). As I’ve added quite a few fuses and relays, the diagram needs a bit of careful planning. Although I don't intend to continue the off topic discussion, I would like to point out, the 12v line feed you refer, if it's live only on ignition, it's correct to be a green without trace. From what I read yesterday from phills standard reference. I have added plain green and plain purple wires to my eBay wishlist. 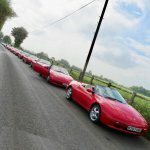 I found one seller that provides all the required combinations for me to wire correctly both the Elan's as well as my other Toyota's. They also sell bulk packages with multiple colours, but none was a pick and mix kind. So I asked them if it's possible to get a discount to buy 12 5m strands with the exact colour combinations I require. Absolutely; that one’s right; it’s the green/black that differs from the manual, which shows green on the supply side of the relay coil and black/orange on the feed side. I was referring to what’s actually on the car, not what the standard or the manual says. IME, the Elan wiring conforms pretty closely to the standard. Tuga2112 wrote: I found one seller that provides all the required combinations for me to wire correctly both the Elan's as well as my other Toyota's. this is the link to the ebay page of the 1mm wires you just pick the base color, and inside the wire page you have multiple options for each tracer. Tuga2112 wrote: the simplest solution i can think of to solve this would be to use a couple of diodes forcing current to flow exclusively from the RCL (remote central lock) box brown wire into the GR/GW pair. an alternative i can think of as well (and this is more appealing because i have the tools at hand) is to use a couple of my spare relays for the job. João, as others have said, the total power demand is ~90W so current will be ~8A. The diodes would work (provided they were rated at 5A or greater) but I would question whether your eBay alarm would cope. A double pole relay would be more elegant, but two single pole relays rated at 5A will work fine. Personally, I'd have a single 10A fuse as close to the battery/main fuse as possible in the supply to the relays so the cable is protected. I have bought a remote central locking box from e-bay and having read the article posted explaining how I to install the unit I have come to cut the red/black wire in the connector to the main fuse box, but there is not a red/black. There is red/grey and red/green, I have tried cutting and joining the white and orange/black to each in turn, but no avail. I can here the remote box clicking when I try to open or close the doors but nothing happens. I am not the best electrician, can anyone help me with this? Question 2: Is the locking box you’ve bought an Elan SE one, or is it generic? (The S2 doesn’t have a locking box as central locking is handled through the alarm). Question 3: If your locking box is generic, did it come with a wiring diagram? This will help us to get a handle on the situation! It's also worth knowing whereabouts are you located. If you're down the road from me, I could take a look. The remote box is the same as tuga2112 wrote an article on and I have used that article to install it using Figure E, the car is a 1990 SE. I hope this will help you to help me. By the way I live in Ilkeston, Derbyshire. Over to you then, Joao; it’s not an SE or S2 part, so you’re likely to be the only one with experience. Saltire wrote: Over to you then, Joao; it’s not an SE or S2 part, so you’re likely to be the only one with experience. well, i guess its s challenge in a way.. but i gotta admit there is some joy in the reward of figuring out the wiring diagrams and makign somethign work... even if its not on my own car. Ampera, i do recall vaguely having the intention of writing up a guide, although i dont remmeber if i done it or not, but, if our lock mechanism is the same wiring diagram. then you will be fine. I will take a few pictures of my car to show where i tapped into the wire that signals/trigger the lock and unlock mechanism. and will also get a refresher on the exact wiring procedure tomorow after work. i hope you are good with simplistic paint based colored drawings. as i tend to use that often to explain electrical setups. I assume you got yourself a good live and ground wires already and just need to be sure to connect the system into the CDL, is that correct ? Tuga2112 you posted the Fitting a Universal Remote Door Lock (#306728) on 19/05/2015. I have a good live and earth taken directly from the battery connections and I believe I followed your article to the letter. the wire your soposed to cut and tap into is the Yellow/red one at the door. btw, to avoid any doubth. that orage diagonal line is there to mean that you cut the wire, instead of tapping into the connection. that circuit needs to be completed VIA the box. im guessing theres a better description than "tap" which i hope someone correct me there ? it shoudl be easy to identify it as the one at the centre of this picture. I will correc the guide for anyone in future folowing it. I have found the yellow/red cable in a mass of cable where an alarm had been previously wired in the car. I should say at this stage when I bought the car the alarm immobilizer would not release and therefore the car would not start, the seller called an auto electrician who cut the immobilizer and alarm wires so the car would start and I have been diving it for 3+ years like that but every year I try to improve the car. This year central locking and heated seats, last year up rated brakes. Now the frustrating bit I have joined the remote box into the y/r wire, the good bit, the central locking now works properly using the key in either door, the bad bit is that nothing happens using the remote. Now I am probably going to make myself sound stupid. I have a multi meter so I thought I would test to see if anything was happening but I have tried connecting the 2 orange/black and white cables as pos/neg across the meter, I have tried each cable pos/earth and on numerous settings, Ohms, Volts etc. So what is the correct way please to test this remote box so I can be confident it is delivering the pulses correctly? You are probably saying the worst combination in life is someone with a multi meter who does not know what he is doing, but I started by saying I am not the best auto electrician, so please be easy with me. If I remember correctly (and I may not, because I have an S2 rather than an SE), the remote triggers the alarm, which in turn triggers the Central Door Locking module. If someone’s removed the alarm, then the remote has nothing to work with. The reason it works when you use the key is that then you’re working directly with the CDL module and the alarm is not involved. Can’t comment on the orange/black and white cables, as I haven’t used that secondary module. in the remote box (assuming you got the same box as mine), there are also a constant feed wire (which should be fused) and a ground as well as the 6 wires that i put in the diagram. you will need to also connect those 2 in order to get the relays to trigger. its also worth mentioning that for this to work, you must cut the Y/R wire, and connect the ends to the orange/black and white cables as per diagram. Then i would also ensure the orange and the white/black wires are connected correctly. the fact that your doors are both working fine while the y/r wire is cut, suggests your white and orange/black wires are correctly setup. the way the sistem works in the car, is that the Yellow/Red wire in the car, is used to transfer a pulse, the pulse can be positive or negative 12v, that means one of the door ajar switches has locked(unlocked), which then the CDL from factory interprets and sends a (stronger and longer) pulse via the yellow/pink and yellow/black pair to the motors and open/close the locks. BUT when you use your remote, you effectively "fake" the signal as if someone inside the car had pulled up one of the locks. i may be going around in circles here, and apologies if i do, but this is one of those things that is clear in my head, but incredibly difficult to explain in writing specially without having the car in front of me. as a side note. i suspect the relays clicking in the box are not related to the pulses used for the locking, i believe they are connected to the turn signal wire (brown) because when you click the "find my car" button in the fob, you will hear the relays clicking, and that button does not trigger the central locking mechanism. clear as mud hein ? if you fancy road trip on sunday, you can come round my area, and i can help you with the instalation in your car as well as showing how its been done on mine. this is all under assumption the weather is worthy of being outside.